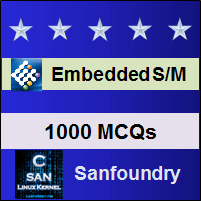 This set of Embedded Systems Multiple Choice Questions & Answers (MCQs) focuses on “Sources of Interrupts”. 1. Which interrupts are generated by the on-chip peripherals? Explanation: The internal interrupts are generated by the serial and parallel ports which are on-chip peripherals. 2. Which of the following is the common method for connecting the peripheral to the processor? Explanation: The common method for connecting the peripheral to the processor is the external interrupts. The external interrupts are provided through the external pins which are connected to the peripherals. 3. Which interrupt can make a change in the processor’s mode? Explanation: An exception is an event which changes the software flow to process the event. It includes both internal and external interrupts which cause the processor to change to a service routine. 4. How many exceptions does an MC68000 have? Explanation: The MC68000 have 256 table entries which describe 90 exceptions. 5. Which interrupts allows a protected state? Explanation: The software interrupt can change the processor into a protected state by changing the program flow. 6. How a software interrupt is created? Explanation: The software interrupts includes a set of instructions for handling interrupts. The instruction set allows a currently executing program to change its flow. 7. What does SWI stand for? Explanation: The instruction set of software interrupts are provided by the special instruction set. One such is the SWI which is commonly used in Z80. 8. Which of the following use SWI as interrupt mechanism? Explanation: The PowerPC and MC68000 use TRAP instruction set for accessing software interrupt. IBM PC uses 8086 NMI. Z80 uses SWI for accessing software interrupts. 9. Which of the following supplies additional data to the software interrupt? Explanation: For using the software interrupt more effectively, the additional data are used, which specifies the type of the request and data parameters are passed to the specific ISR. This additional data are offered by certain registers. 10. Which software interrupt is used in MC68000? Explanation: The MC68000 uses a software interrupt mechanism for accessing interrupts from the peripheral in which the instruction are created using the TRAP mechanism. 11. Which of the following are accessible by the ISR in software interrupt mechanism? Explanation: The additional data are offered by certain registers and these additional data are used to specify the type of the data parameter and the request with the specific ISR when running in the software interrupt mode. 12. What allows the data protection in the software interrupt mechanism? Explanation: The switching between user mode and supervisor mode provides protection for the processor, that is, the different modes in the software interrupt allows the memory and the associated code and data to be protected from each other. 13. What does NMI stand for? Explanation: The NMI stand for the non-maskable interrupt in which the external interrupts cannot be masked out. 14. Which NMI is used in the IBM PC? Explanation: The most commonly used non-maskable interrupt is the 80×86 NMI, which is implemented in the IBM PC. 15. Which can be used to pass the status information to the calling software in the software interrupt mechanism? Explanation: In order to use the software interrupt more effectively, the additional data are used to specify the type of the request and data parameters are passed to the specific ISR. This additional data are offered by certain registers. These registers are accessible by the ISR and it can also be used to pass the status information back to the calling software.